Dr. Danielle Lavallee is a patient-centered outcomes researcher whose work focuses on developing novel processes for collecting and reporting patient-reported data in a manner to support both clinical and patient decision-making. Dr. Lavallee is formally trained in Health Services Research with a specific focus in qualitative methods and patient-centered outcomes research. She holds a PharmD from the University of Kansas and a PhD in pharmaceutical health research services from the University of Maryland. In addition to her appointment in the Department of Surgery, Dr. Lavallee is the UW Medical Director for Patient Generated Health Data. 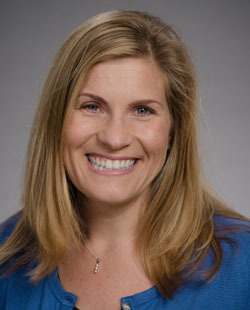 Through ongoing work with the UW Medicine Office of the Chief Medical Officer and UW Medicine Accountable Care Network, her work aims to build on best practices to identify and scale patient-centered approaches strategically across the healthcare system to improve patient outcomes and healthcare quality. Ehlers AP, Khor S, Cizik AM, Leveque JA, Shonnard NS, Oskouian RJ Jr, Flum DR, Lavallee DC. Use of patient-reported outcomes and satisfaction for quality assessments. Am J Manag Care. 2017 Oct;23(10):618-622. PMID: 29087633. Thornblade LW, Truitt AR, Davidson GH, Flum DR, Lavallee DC. Surgeon attitudes and practice patterns in managing small bowel obstruction: a qualitative analysis. J Surg Res. 2017 Nov;219:347-353. doi: 10.1016/j.jss.2017.06.052. Epub 2017 Jul 22. PMID: 29078904. Lavallee DC, Comstock B, Scott MR, Avins AL, Nerenz DR, Edwards TC, Patrick DL, Lawrence SO, Bauer Z, Truitt AR, Jarvik JD. Study of Methods for Assessing Research Topic Elicitation and pRiorizization (SMARTER): Study Protocol to Compare Qualitative Research Methods and Advance Patient Engagement in Research. JMIR Res Protoc. 2017 Sep 7;6(9):e168. doi: 10.2196/resprot. 7565. PMID: 28882810.